A day at the races RISC OS event. It’s approaching the end of April 2013, and this year’s Wakefield Show has come and gone. This year’s show was the eighteenth, and was once again held at the Cedar Court Hotel, very close to junction 39 of the M1 – the same venue at which it has been held for the last few years, and where the show was originally held all those years ago. As usual, I was there to demonstrate and discuss my products, and also – in theory – to get a gist of what was happening so that I could report about it on RISCOSitory. Things didn’t go quite as planned, however, and I barely left my stand throughout the entire show for a number of reasons, ranging from still being tired after an extra long drive the day before through to generally being that much busier than usual on the stand itself. One of the reasons I was busier was that Jim Nagel, Archive Magazine‘s editor and who has been to every Wakefield show since the second, was unable to attend the show due to unforseen – and unfortunate – circumstances: His wife had taken a tumble a few days earlier and suffered a broken arm as a result, which meant Jim had to be her carer, cook and chauffer. Even so, the decision not to attend wasn’t made until the 19th – the day before the show – at which point Jim contacted me, and asked if I could take any subscription renewals at the show on his behalf, which I was happy to do – so the Soft Rock Software stand doubled up as an Archive-proxy stand. Another reason I was busier was that the show itself seemed to have attracted more visitors, which in turn meant more people stopping by to discuss my wares, and any number of other RISC OS matters. I commented about this to a number of people during the day, making the observation that there seemed to be plenty of people still wandering the show even when the theatre presentations were underway. And at the end, while packing things away, Chris Hughes of the Wakefield RISC OS Computer Club – the show’s organisers – confirmed that attendance was up on previous years, though he didn’t have firm numbers at the time. He has since told me that attendance has been on the increase for the last two years, and that this year there were over 160 visitors to the show compared to around 140 last year – a trend I’m sure we all hope continues, and for all the RISC OS shows, not just Wakefield. The WROCC stand was, as usual, the first stand a visitor would see when they entered the show. The club is now thirty years old, and – opting for Pi instead of cake – was giving visitors and exhibitors alike the opportunity to enter a prize draw to win a Raspberry Pi in a clear case. The draw was conducted at the end of the show, with Martin Wuerthner pulling the winning ticket from the tombola, and the Raspberry Pi went to Richard Brown of Orpheus Internet. Also available from the WROCC stand was the third edition of the Wakefield Back Catalogue, a CD containing WROCC newsletters going all the way back to the very first one, along with a slideshow from the 2008 show, and a video of the 1998 show. The club’s immediate neighbour was the charity stand, which was raising money for the Wakefield Hospice – the usual good cause for this show, which aims to provide “the highest level of symptom management and care for people who have advanced active, progressive and life threatening illness.” This year, the total amount raised for this very worthy cause – by both the charity stand and Steve Fryatt, who’s show proceeds also go to the charity – was £810. Describing themselves as “a community dedicated to encouraging and supporting the development of brand new games for “retro” computing platforms” as well as being a publishing label for Acorn computers, the Retro Software stand was next, providing a source of new software for older platforms. Amongst the goodies on sale this year was Repton – The Lost Realms. Next up was the BeebMaster stand, where Ian Wolstenholme was showing off a variety of items from his collection that hold a particular, personal significance to him in the development of the BeebMaster website. Ian had also brought along a selection of goodies to sell from BeebShop, BeebMaster’s sister site, through which he sells spares and upgrades for BBC Micro enthusiasts. Bridging the old/new gap, the next stand was Jason Flynn‘s. Jason was demonstrating the latest USB Econet NIC, to allow modern computers, equipped with USB, to connect to legacy Acorn Econet networks. Also being demonstrated on this stand was SoftMDFS by J. G. Harston, running on a Raspberry Pi, serving files onto the show Econet. 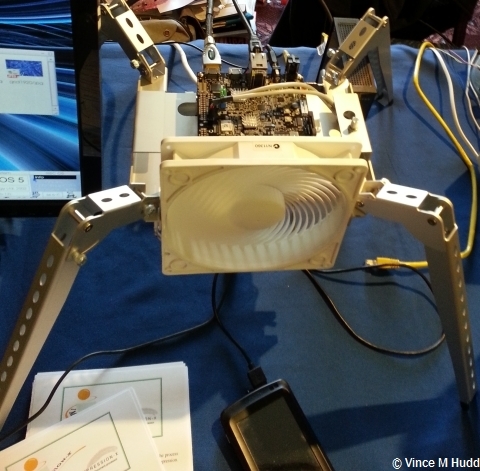 Aemulor Pi was unveiled at the show, by developer Adrian Lees. Aemulor Pi is, as its name suggests, a version of Aemulor that runs on the Raspberry Pi. Aemulor made its first appearance when the IyonixPC was launched by Castle Technology, and its purpose was to emulate a 26-bit environment on the new machine, whose CPU no longer provided a 26-bit mode. This allowed old, but very popular software, such as the Impression family, to run on the 32-bit only computer even though it hadn’t been updated – and the Raspberry Pi version, which costs £18 and is available from both Spellings.net and CJE Micro’s, is designed to achieve much the same goal. The next stand was Usable Range, where Keith Dunlop was showing off ‘Project Cool’ – a PandaBoard mounted on four struts, with a large fan attached to the front, to help keep the temperature down – particularly useful if the board is overclocked, which the PandaBoard can be, from its usual 1.2GHz to 1.5GHz, and which Keith usually does. The whole thing looked as though it should be walking around, and has the honour of being the only subject matter of any photographs I took this year. One of the busiest stands of the show had to be R-Comp‘s, where Andrew Rawnsley and the team appeared to be inundated with visitors throughout the day. This year, R-Comp launched two new computer systems, the ARCimedes (or ARCie to its friends) and the ARMicro. The first of these is so named because it comes in a case called the Arc – and, as “RISC OS people”, Andrew says R-Comp couldn’t resist producing a computer in a case with that name. In a press release a few days before the show, he explained that their first inclination would have been to design a pure-ARM system, but the size of current boards on which RISC OS can be run – the PandaBoard, BeagleBoard and Raspberry Pi – rather dictates against that; the Arc chassis represents a small/mid tower offering. This is, therefore, a machine which provides a RISC OS experience – via emulation – on either Windows XP or Windows 7. The other machine, the ARMicro, brought along in prototype form, harks back to the old BBC Micro and A3000 designs, by being a “single box” computer, with a keyboard and touchpad incorporated into the chassis. This computer, unlike the ARcie, is ARM based, being powered by a “modified Raspberry Pi setup,” with a decent amount of high-speed storage – all a user needs to be up and running with this computer is a suitable DVI/HDMI-equipped monitor. Orpheus Internet had the next stand, where Richard Brown was talking about the services offered by the RISC OS-friendly ISP – and, more importantly to some people (ahem! ), giving away sweets. All of Orpheus Internet’s Fibre to the Cabinet (FTTC) offerings now come with a maximum speed of 80Mbps down and 20Mbps up, subject to the usual physical limitations (line length, etc), and for those who use Orpheus for hosting, their newest server provides a control panel interface for administering the service. Annoyingly just out of reach of Richard’s Sweets for most of the day, because he had them on the wrong end of his table, I was next on the Soft Rock Software stand. As usual, I was giving my usual excuses for not having finished the WebChange manual, amongst the many other things I haven’t done.Visitors to my stand could also purchase a new edition of Chris Hall’s “Getting started with RISC OS on the Raspberry Pi” book, now expanded to include some BASIC programming instruction, including a complete type-in listing of his Cat application, which presents the user with a disc catalogue in the form of a tree diagram – and Chris was on hand throughout much of the day to talk about the book. And, as explained above, I was also taking subscriptions for Archive Magazine on behalf of Jim Nagel, who was unable to attend. Next, the RISC OS personal information manager, Organizer, was being punted by Martin Avison and Nigel Willmot. Version 2.20 of the electronic filofax was lauched at the show, this being the first official release with the network solution that was discussed at the South West show earlier this year. After Organizer, Christopher Dewhurst was promoting Drag ‘n Drop, the PDF magazine that he took over from Paul Stewart late last year. Chris was selling a compilation of all fifteen issues so far for £10 and, with volume four issue three being announced just after the show, that means show visitors who purchased the compilation got to see the latest issue before anyone else. Also available from Christopher was the long-awaited “55 BBC Micro Books” CD-ROM, also priced at £10, and containing a collection of digitally remastered programming books in PDF and HTML format. Taking up what is starting to become their customary position in the corner of Cedar Court’s Cypress Suite, RISC OS Open Ltd were next, where Ben Avison, Theo Markettos and Rob Sprowson were on hand to discuss and demonstrate the latest versions of RISC OS 5. Steve Fryatt occupied the next stand, where he was demonstrating CashBook, PrintPDF and all his other software – notably including Locate 2.00, a flexible file searching application that had previously only been released as a test version. Another busy stand, Chris Evans and Andrew Conroy of CJE Micro’s/4D were ready and willing to sell you just about anything you could think of, and more besides – if it existed, and could be useful to RISC OS users, there’s a good chance they would have found a way to squeeze it into their vehicle and bring it to the show. As 4D, they have also now increased the specifications and reduced the prices of their PandaRO Pro computers, which are available in one of three cases, and are based around the PandaBoard ES. After CJE, and on the last stand progressing around the show, Martin Wuerthner of MW Software was available to persuade visitors to buy ArtWorks and EasiWriter, etc., though, unusually, Martin didn’t have new versions of either for this show – presumably because he is still in new-dad mode, after the birth of his daughter, last year. As noted above, other than the few I took of Keith Dunlop’s Project Cool, I didn’t take any photographs this year – so those who need photographic evidence that the show really did take place, and that wasn’t just a figment of my imagination, a selection can be found on the WROCC website taken by Ian Macfarlane (mostly taken during the show) and Steve Fryatt (mostly taken before it started).